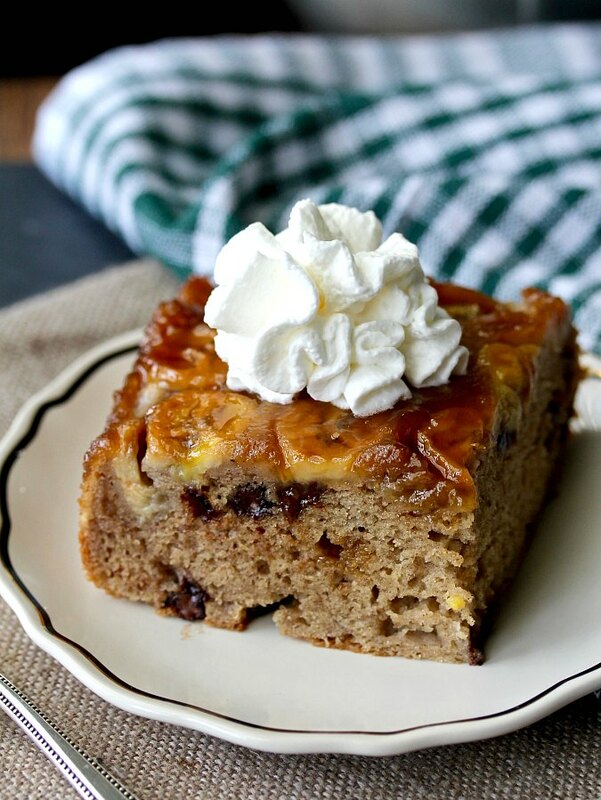 This Banana Chocolate Chip Upside-Down Snack Cake is wonderful served warm with ice cream or whipped cream. 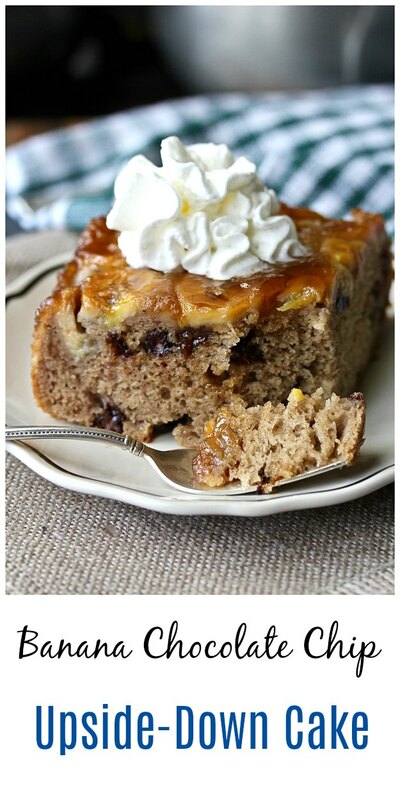 The caramelized banana topping is really tasty, and the cake itself is soft and moist. This banana upside-down cake is both topped with caramelized bananas and filled with banana puree. There are also melty chocolate chips in there, along with cinnamon. This cake is so moist and "snack perfect." This cake is super easy to make, and the ingredient list is pretty flexible. You can use regular or low fat sour cream, or even buttermilk or yogurt as well as any type of chocolate chips or chunks. You can keep leftovers of this cake in the refrigerator and re-warm them in the microwave for 15 to 20 seconds. You can also re-warm the cake in the oven wrapped in foil at about 300 degrees F.
This month, the Fantastical Food Fight theme is bananas. There's an International Banana Festival this month in the "other" Twin Cities, Fulton, Kentucky, and Fulton, Tennessee. It has something to do with the development of refrigerated railroad cars so that The U.S. could get bananas, and Fulton having the only ice house on the route north to Chicago. There's a banana ball, parades, and top banana memberships. If you're ever on Jeopardy... now you know! After the recipe, be sure to check out the rest of the recipes using bananas from the Food Fight participants. Put the brown sugar and butter in an 8 inch square metal cake pan. Warm the pan over low heat on your stovetop, stirring until the sugar is just barely bubbling. Remove from the heat and let cool to room temperature. Slice the bananas into 1/4 inch slices and arrange them in the pan, slightly overlapping the edges. Sprinkle with lemon juice. Heat the oven to 350 degrees F. Whisk the flour, baking powder, baking soda, salt, and cinnamon together in a large bowl. Whisk in the sugar. Mix the butter, egg, egg white, banana puree, sour cream, and vanilla together in a small bowl. Add the wet ingredients to the flour mixture and stir until just combined. Fold in the chocolate. Pour the batter over the bananas in the pan, and gently smooth the batter, being careful not to move the bananas at the bottom of the pan. Bake the cake for about 40 minutes, until the center is just set. Cool in the pan on a rack for 20 minutes. Run a thin knife along the sides of the pan, and invert it over a serving plate. Ha ha. The caramelized bananas were wonderful. The cake looks so good - those caramelized bananas though - they have me drooling! 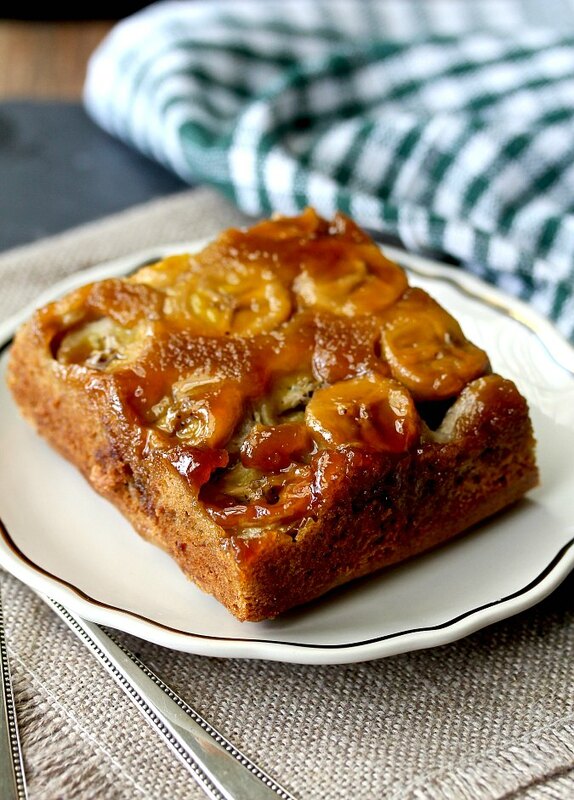 I love this idea of using bananas in an upside down cake. YUM!!! oooh this sounds amazing, karen! Ohhh those caramelized bananas! I agree with Cindy, it most definitely is snack perfect! This is a real treat, caramelized bananas are yummy.